When we were in Lidls buying the mince pies, we couldn't believe who we bumped into. Some of the actual Star Wars cast. Apparently they would also heard about the fantastic mince pies in Lidls and so they were stocking up, ready for Christmas. So Nia whipped out her iPhone and we managed to interview a few of them. We did our best, but they weren't all very co-operative. That is probably because it was Lidls and not the Co-Op. Yes, very funny. 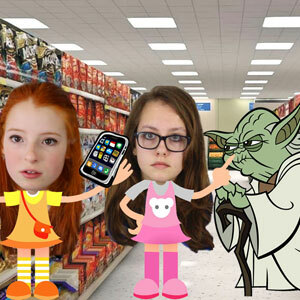 So here is the script and video of us talking to lovely cartoon Yoda. Excuse the background noise of the beeping checkouts and stuff. And then we bumped into Yoda, literally. Well he was so short that we didn't seem him there looking at the cheese and onion Pringles. Oh look, there is that cute gremlin man with the big ears. Do you mean Yoda. Quick Nia, are you recording this on your iPhone? No, don't worry, it is not a weapon, it is just Nia's iPhone. We're doing a food shop Yoda. We can't find the Lidls mince pies though, do you know where they are please shorty? Thanks. They look so tasty. Yes, eat eat. I can't wait. They've sold out of candy canes though. We've got to go now Yoda, we've got homework to do. I've got revision to learn as well Mr Green Man. OK, top tip there Yoda. Thanks. Christmas Merry Have You Yoda.